What if we, as an entire church, devoted a full year to reading through the scriptures together? To grow in knowledge, understanding, and devotion to the one and only book in existence that is actually ALIVE! In January, we launched a church-wide, two-track Biblical literacy initiative, inviting the entire congregation to join us in reading the Bible together. You can pick up with us at anytime! Bring a physical bible to church. Let’s read and look up references in a physical book. Break in the glove, so to speak, by catching with it – actually USING pages and binding – imagine that! We’ll be strengthened in our understanding of where books are in relationship to one another and the relationship between the Old and New Testaments. To get started reading, download the READ SCRIPTURE app. This FREE app will be the “spine” we will use and flesh out during Sunday AM Classes. This is a fantastic guide that includes brief overview videos – from The Bible Project – of each book of the bible! Not into the apps? No problem! 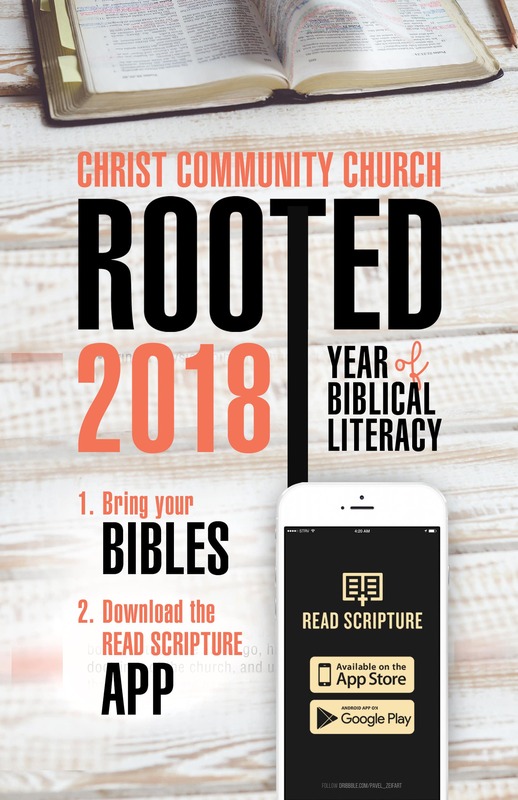 You can read online or print the 2018 Reading Plan and follow along with us throughout the year. In our Sunday Morning 10:00 am Classes (August-June, off in July), our teachers will be giving us a grand overview of the books of the bible as we go, highlighting 13 critical doctrines of the church, and unpacking a framework through which we can understand the whole story of the bible. It promises to be a rich and engaging year! A special reading plan is offered for C3 Kids as well, following the same plan as all adults and students! Each month, grab a bookmark from the C3 Kids Elementary Welcome Desk in the C-Wing. The bookmark includes the daily readings for elementary students for each month of the year, and a chance to earn tickets to Mr. Doug’s Store as they complete the readings! For questions about the adult reading plan or Sunday classes, email Diana Batarseh. For questions about the C3 Kids reading plan and bookmarks, email Becky Clark.